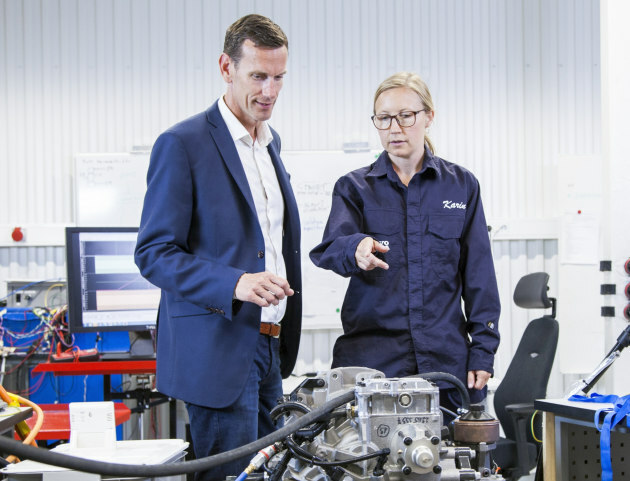 Volvo Penta’s chief technology officer, Johan Inden, and system engineer, Karin Åkman, at the company’s new development-and-test laboratory in Gothenburg. Engine manufacturer Volvo Penta has outlined plans to offer hybrid and all-electric power solutions for marine users by 2021. Ingemanson added that while the shift to electric power is part of a “long-term transition”, diesel and gasoline-powered primary drive systems will remain the most appropriate power source for many applications for years to come. Johan Inden, Volvo Penta chief technology officer, says the company is already several years into its electrification journey. As part of the switch to electric propulsion, Volvo Penta said it will be ramping up its electrification investment program. As part of this process, it has already established an electromobility development-and-test laboratory at its Swedish headquarters. In the future, the company plans to offer both hybrid and all-electric solutions from the outset and is already field testing prototypes with system validation under way. “We have a deep understanding of power systems in a wide variety of applications, which we will use to help customers meet the transformation towards sustainable power solutions in the months and years ahead,” says Inden.